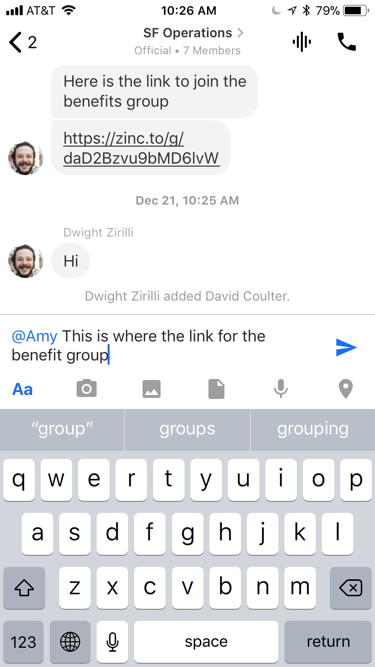 Zinc allows you to easily call out the attention of another team member in your group. When a team member is mentioned, they'll receive a push notification letting them know their attention is needed. How do you mention someone? In any conversation, when you type @, a list of all the members in your group will be listed. Simply choose the name of the person you want to mention and they will will receive a notification. For users that have the same name, Zinc will pull the first letter of their last name so you know exactly who you're sending the message to. A user must be part of your conversation before you can mention them. If they aren't in the group, you'll need to add them first and then type @mention to call their attention. If a user has muted their conversation, an @mention will break through their conversation, and a user will get the notification. However, if a user is on Do Not Disturb Mode, @mentions notifications will not come through.